The Phoenix tells me Airman Anderson’s Chicken has been quite the reader favorite. We sure like it too, but I don’t usually have the time and energy by the end of the day to make it, so we (me and The Phoenix, we make a good team) came up with an easier, faster version that just happens to be a little healthier too, since we’re not deep frying the chicken. I thought it only proper to pass along the adapted recipe to you too. Now, we cook the chicken in a wok, but if you don’t have one, I’m sure a large skillet will work. Here’s a look at the sauce as it begins to simmer together, you’ll probably want a large skillet to do this in so it won’t take long to reduce. 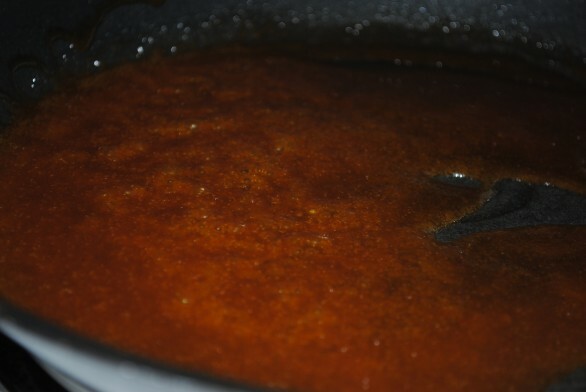 And when the sauce looks like this, and can really coat the back of your spoon, it’s done. Pour it right over the chicken and carrots. Let it cook for another minute longer or so, then serve over rice and garnish with green onions if you like. The Phoenix definitely likes his onions, so we don’t leave this out. So, yes, I went a little picture-crazy for this recipe. I hope you don’t mind. It was so much fun since I made it for lunch and actually had natural light to work with as opposed to the silly daylight savings time that I deal with for dinner each night. Thanks, again, Sunny Anderson, for such a great recipe idea! We love it! And if you have the energy to go all out, here’s the original recipe. 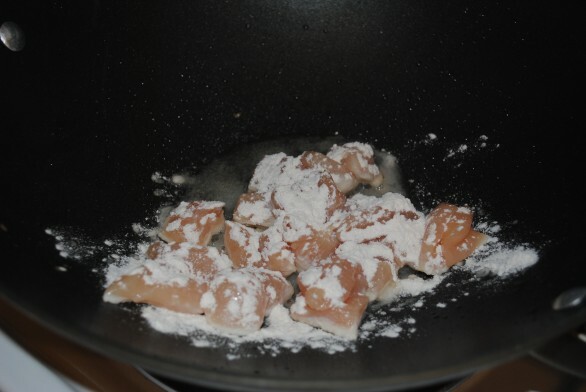 Once it\'s nice and hot, add chicken and sprinkle flour on top. Stir occasionally, until chicken is cooked through. 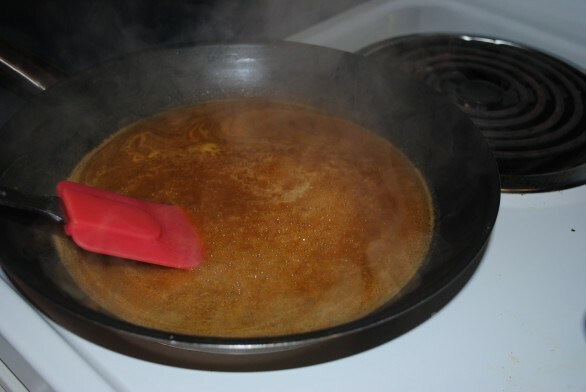 Meanwhile, in a large saute pan, combine orange juice, brown sugar, butter, red pepper flakes and Worcestershire sauce. 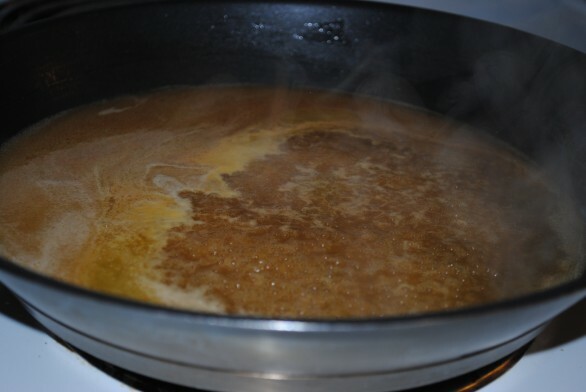 Stir, bring to a boil, then reduce heat and simmer until thickened. My sauce is usually done by the time my chicken is cooked through. 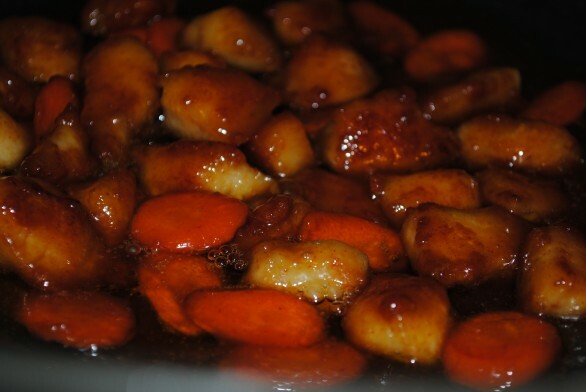 Once chicken is almost done cooking, add carrots and stir. 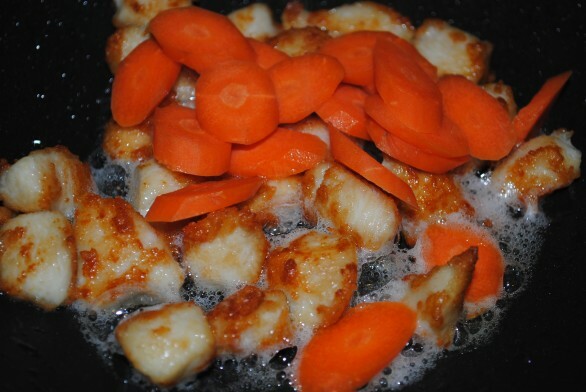 Pour sauce into wok with chicken and carrots and let simmer a minute or so on low to thoroughly coat. 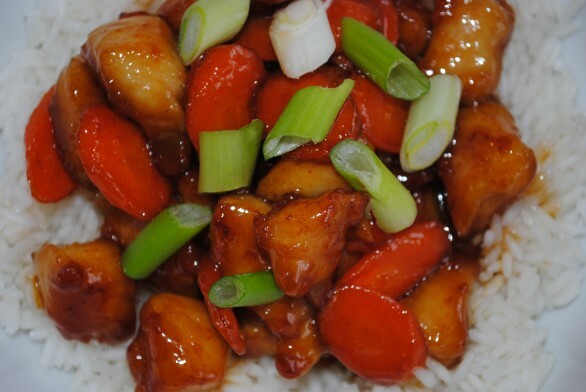 Using a slotted spoon, place chicken and carrots on a bed of rice and garnish with scallions. Enjoy! Thanks, Mark! This is what Matt wanted me to make while you were here for Thanksgiving but we ran out of time. Definitely next time though! I have the best wife in the world. 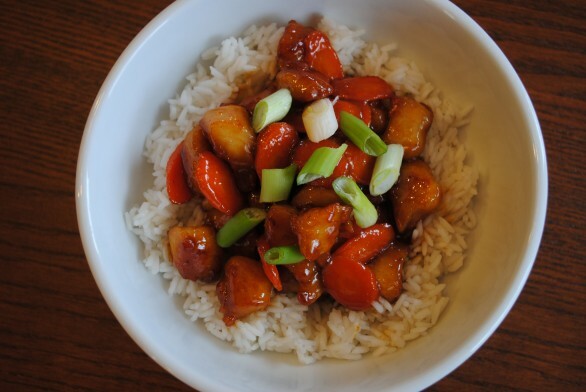 Most people would have to go out to Pei Wei or PF Chang’s to get something like this for lunch. But I get it at home just because. Love you V.
I finally made the “Airman Anderson Remake” tonight. It was delicious!! Don loved it too. It wasn’t as hard to make as I thought. Instead of making rice I bought a frozen bag of refried rice. It made the meal complete! Thanks for the great recipes Vanessa! I made the “Airman Anderson Remake” last week and again last night. I absolutely love it! Thank you for sharing the recipe Vanessa. You’re welcome. It’s definitely one of our favorites!